This watercolor painting uses several watercolor techniques. First, an abstract wash of color was laid down. As it dried, salt was sprinkled which created a unique texture. 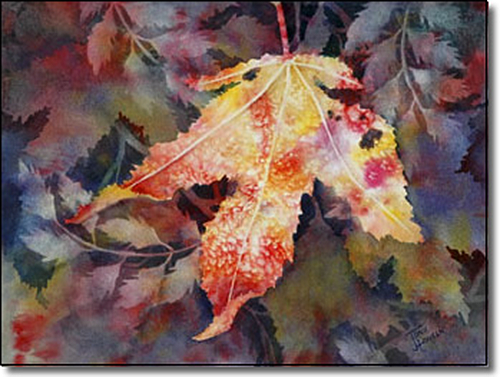 After the first layer dried, the leaf was drawn and the negative space surrounding the leaf was painted in deep hues. When the second layer dried, the shapes in the background were lifted out, leaving muted tones of the first wash of color.